Once a case is enrolled in FMEP the payor is required to send all payments to us, rather than directly to the recipient. This ensures we keep accurate and up-to-date payment records. We record the payments as being made and then forward them on to the recipient, usually the same day. We encourage the payor to send payments to us electronically and the recipient to receive payments by direct deposit. These are the fastest, most secure ways for payments to be made and disbursed. If payments are late or missed, interest and default fees can be charged. We can also take various enforcement actions against the payor to collect the maintenance. FMEP can take various actions against the payor to collect the maintenance if payments are not made. We have agreements with all Canadian provinces, the US and several other countries who can take action on our behalf. Need to increase or decrease maintenance? 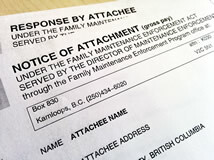 Maintenance can continue past age 19 if the child remains dependent on the recipient. Learn about getting started with the Program and the easiest ways to get information about your case.